Moving away from the structured, textbook mentality of traditional classrooms, new approaches to education are bridging the gap between theoretical and applied learning - creating new opportunities to immerse yourself in practical environments, and better harnessing the world around you to contextualise otherwise foreign principles. At one end of the spectrum, the proliferation of virtual & augmented reality technology is re-imagining traditional approaches to structured learning models by bringing an unprecedented level of 'reality' to simulated environments. Google's Expeditions program pioneered the use VR in education, allowing teachers to take the whole classroom on virtual, guided field trips around the world (or universe) and explore the curriculum in a 3D and virtual environment - using cheap scaleable hardware like the Google Cardboard. By ‘being’ in the space, students can visualise and put into context what they are learning. In the US, Change Talk 2.0 offers a virtually simulated environment where doctors can practise holding sensitive conversations with patients like those surrounding weight or lifestyle, see real-time feedback and develop better 'bed-side' skills. Labser, a virtual teaching platform out of the US, gamifies science by transporting students into a virtual ‘lab’ environment where they are able to engage with lab devices, undertake experiments & see results – all through a laptop or Samsung Gear headset. 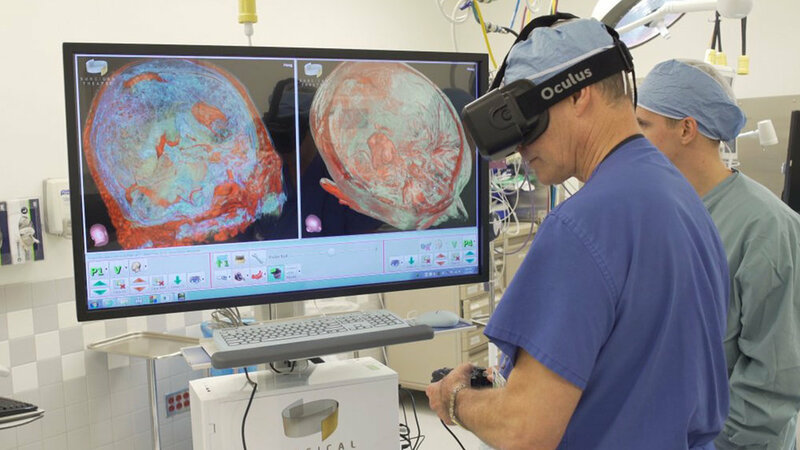 The Surgical Theatre initiative leverages VR to bring surgeons inside a patient's skull. Building on existing medical data like MRI scans to create custom 3D virtual models, surgeons can dry run complex brain surgeries before they make a single incision. At the other extreme, is the idea of harnessing every-day environments and contextualising the learning of a new principle in the world that surrounds you. This notion of 'micro-learning' has gained particular traction in the world of linguistics where it has long been recognised that contextualising and immersing yourself in a foreign culture amplifies your ability to learn quickly. However, recent approaches have shown that the right tools could turn your current environment into an equally powerful learning platform. Linguist and language specialist, Matthew Youlden, famously designed a methodology that saw him learn a new language from scratch in just 7 days by tailoring every piece of stimulus he came into contact with that week to reinforce his goal. For the less committed, Youlden argues that practising a language for just 30 minutes a day, without deviating from your daily routine, is just as effective as putting yourself in a foreign environment and trying to learn from scratch. Taking this one step further is the Mersiv concept, a wearable prototype and language learning system that uses the world around you to create tailored learning experiences and lessons as you go about your day. It uses a camera to identify the objects around you, and then delivers micro-personalised language lessons via headphones without you having to stop what you were doing. Whether you're stepping into a virtual world or experiencing the world around you in a new light, what all of these approaches have in common is an understanding of the power inherent in better contextualised learning. As the technologies that support these experiences become more prevalent in everyday classrooms and workspaces, will we see standardised, theoretical training and online learning platforms like MOOCs disappear in favour of applied models that offer greater flexibility, personalisation and practical experience?